Brunswick’s Alex Buckanavage, left, goes after the ball as New Canaan goalie Drew Morris gets drawn away from the net during their game Saturday in New Canaan. NEW CANAAN — Down two to start the third quarter, Brunswick’s Ben Shapiro won the faceoff, sprinted down the field and scored. 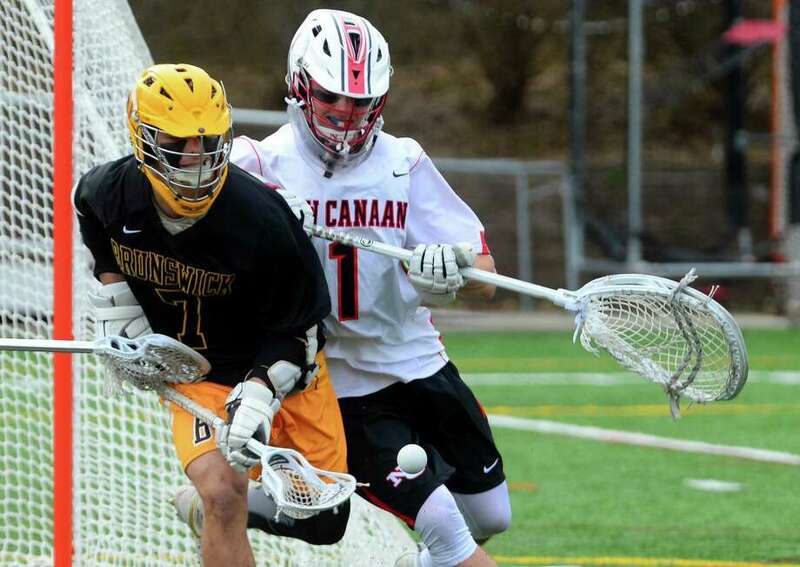 From there the Bruins offense took off, tallying six second-half goals to beat New Canaan 7-5 Saturday. After scoring just one goal in the first half, Shapiro’s goal was enough to get Brunswick clicking. After Alex Buckanavage staked Brunswick (5-1) to a 1-0 lead after one, New Canaan went on a 3-0 run in the second with goals from Matt Bisceglia, Mac Deane and Jackson Appelt. Appelt’s goal came with 52 seconds left in the half, aided by an 80-yard pass from goalie Drew Morris to set up Appelt with a wide-open cage. In addition to the assist, Morris was stellar in net for New Canaan all day, tallying 13 saves, many from point-blank range. Even playing his best, Morris didn’t have a chance against Brunswick’s Buckanavage and Xander Dickson. The two combined for four second-half goals with each tallying in the third. With the score tied at 5 in the fourth, Buckanavage found Dickson at the doorstep twice at the 5:32 and 3:07 marks for the winning goals. The rapport between the two was a long time coming. New Canaan’s Jack Hoelzer scored with 2:31 left in the third to end the period tied at 4, and, after a goal from Brunswick’s Jimmy Heidt, sophomore Quintin O’Connell found his brother, Ryan, a senior, to tie it again at 5 with 6:19 remaining in the contest. As has been the case in a choppy early going, New Canaan (2-3) shined at times, but was too uneven for the full 60 minutes. The one silver-lining is that New Canaan’s early schedule has featured a slew of nationally ranked teams. The Rams entered the contest at No. 18 in the Under Armous/Inside Lacrosse National Rankings, while Brunswick came in ranked 13th. Records: Brunswick 5-1; New Canaan 2-3. Scoring: B—Alex Buckanavage 2 goals 3 assists, Ben Shapiro 1g, Xander Dickson 3g 1a, Jimmy Heidt 1g; NC—Matt Bisceglia 1g, Mac Deane 1g, Jackson Appelt 1g 1a, Jack Hoelzer 1g, Ryan O’Connell 1g, Graham Braden 1a, Drew Morris 1a, Quintin O’Connell 2a. Goalies: B—Patrick Burkinshaw (5 saves); NC—Morris (13). Shots: B—29; NC—17.